There are a lot of benefits that come with the transition to independent senior living. Take all the new amenities, for example. In a retirement community, there are often walking paths for exciting outdoor adventures, a family dining room where the grandkids can enjoy a sit-down meal with their grandparents, a billiards room or even a fully stocked library. By letting the grandkids explore all of these new facets of retirement living, they'll become more adjusted to the new space, meet some of your parents' neighbors and have tons of fun while they're at it. Plus, discovering new places means there will be a lot of walking, giving everyone in the family some exercise. 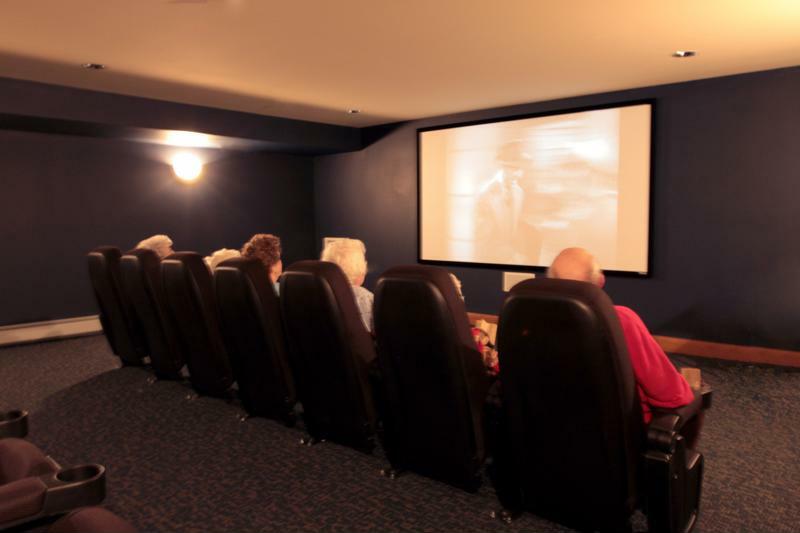 Turn your senior parent's new apartment into a theater by throwing a movie night with the kids. Draw the shades, heat up some popcorn, bust out the fuzzy blankets and gather around the TV. Or, simply visit the community movie theater. Be sure to pick a movie the whole family will enjoy. Entertainment Weekly listed "The Muppet Movie" from 1979 and "Mary Poppins" from 1964 as two of the top films that kids must experience during their childhoods. These older films will please both the kids and adults and will most certainly evoke some laughs, which is perfect for more than a good time. Host a movie night in a real theater! According to research conducted at Loma Linda University, California, a fit of the giggles can even enhance seniors' cognitive function. The study evaluated short-term memory skills between two groups of older adults between the ages of 60 and 70. During a 20-minute break, one group sat silently doing nothing, and another group watched funny videos. The group that watched the funny videos had recall abilities that improved 43.6 percent, whereas the group that sat in silence saw improvement of only 20.3 percent. Diving into the craft box or breaking out a board game is a perfect activity for rainy days, and it's a great way for your kids to spend time with their grandparents. Painting a picture or gluing together a popsicle-stick house can be done right at the kitchen table in your senior loved one's apartment. Not only will games and crafts provide hours of fun, but they can also boost your parents' mental health. A study conducted by Mayo Clinic researchers in 2012 looked at the effects of mind-stimulating activities on seniors. The study revealed that seniors who participated in crafting, playing games and reading books were 30 to 50 percent less likely to experience mild cognitive impairment than those who did not. Adjusting kids to your senior loved one's new living space can be exciting and productive for the whole family. Include these fun activities in your plans for days spent at your parent's independent living center to experience good times and improved health.